Does your dog jump on family and guests, pull on the leash when you walk, chew, bark or run away? It doesn’t matter if this is a puppy getting their first training or an older dog with long term bad habits, we have an obedience dog training program for you. Imagine going for a walk and not getting a sore arm. Imagine not needing a leash. Imagine how much better you and your dog’s life would be if they would listen to you everywhere you went! Contact us today at (979) 530-5577 to schedule a Free Dog Training Evaluation. No Payments + No Interest if paid in full in 6 months on purchases of $99 or more. 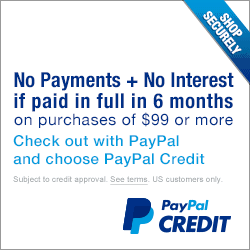 Click the image to the left to learn more about PayPal Credit. There is a 3% financing fee when using this payment option. Do you wish that your dog responded to commands quickly and was so well behaved, you could take them anywhere with ease? Are you living a busy, hectic life and just can’t find the time to train your dog yourself? If so, the Sit Means Sit College Station Board and Train program is for you! This program is perfect if you are headed out on a vacation or work full time, but need your dog to be trained by the best! 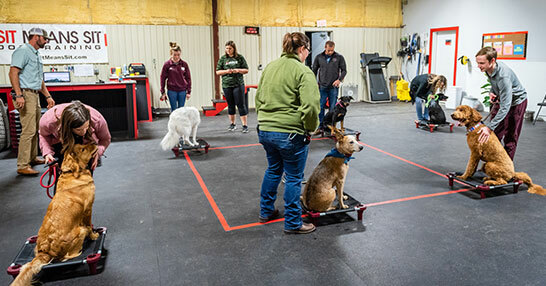 The Board and Train immersion program is for the owner who lives an active lifestyle, but also wants to be involved with their pup’s training. It can be hard to schedule time out of your demanding day to work on instruction and training. Let us take care of it for you, while still keeping you involved. In this program, your dog will work with a certified professional trainer to achieve training goals and learn commands. You will also learn how to maintain your dog’s new skills with our Leadership Transfer lessons and group classes. If you want to get your dog trained to their highest potential, fill out a free evaluation form today to learn more! Do you want to participate in your dog’s training, but need a little help getting started? The Day-Camp Training program is perfect for the family or individual that wants the help of experienced trainers, but also wants to be involved in their dog’s instruction! 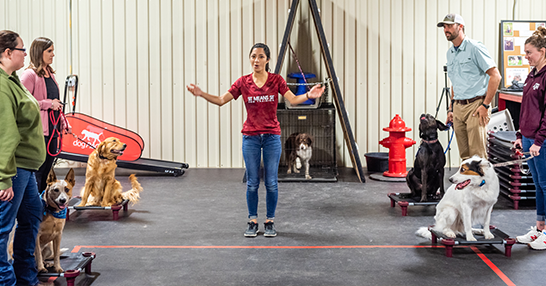 With the Sit Means Sit College Station Day-Camp Training program, you are able to drop off your dog for a day of training with our award-wining trainers, while also having a private lesson with the trainer and your dog at the end of each week. The private lessons in the Day-Camp Training program are personally tailored to your lifestyle and the goals you have for your dog. The specialized nature of our lessons allow you to get the most of our the program and get your dog trained specifically for your needs. Are you ready to work with our trainers to increase your dog’s skills? Give us a call today or get a free evaluation to learn more about Day-Camp Training! One of the most important times in your dog’s life is the first 20 weeks. During this time, it is critical to train and learn social skills early to eliminate problems in the future. 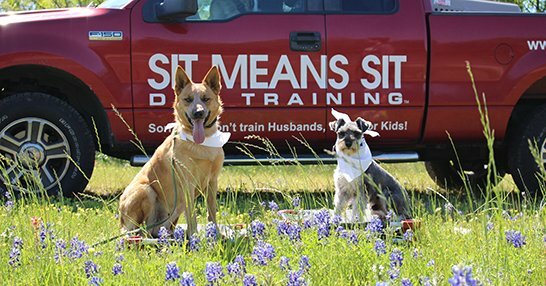 If you want to give your puppy the best training possible, check out the Sit Means Sit College Station Puppy Packages! We offer a combination of immersion program, private lessons, and group sessions to ensure your puppy will be getting a well-rounded experience. During these programs your puppy will be learning skills such as house training, potty training, leash walking, introductory obedience, and most importantly will socialize with other puppies to learn what is appropriate with other dogs. With our program, your puppy will learn to become friendly and outgoing with people and other dogs. By the end of our program, your puppy will be comfortable and confident in their surroundings and environment. Give us a call or fill out a free consultation form today to get started on making your puppy the best they can be! 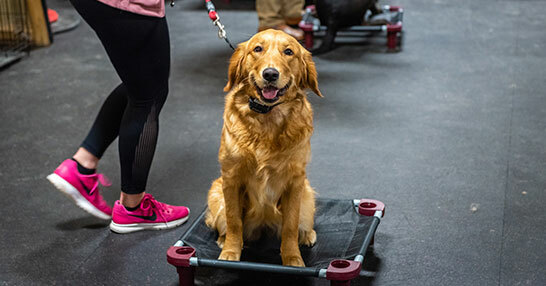 If you’re looking for a program that allows you to be hands-on with your dog’s training, then our Sit Means Sit College Station Private Training program is for you! From start to finish, our private dog training lessons allow you to be directly involved with training your pup. You will learn how to effectively train your dog, with the help of our experienced and professional dog trainers. With the private training lessons, you will have all the attention. Because it is just you, your trainer, and your dog, you are able to tailor the program for your dog’s personality, size, and your personal needs. You are able to make specialized goals specific to you and your dog. We offer flexible scheduling, including evening or weekend appointments and location of your choice, in order to work around your busy life. If you’re ready to be involved in transforming your dog’s training, fill out a free evaluation form today to learn more! If you’re heading out for a vacation or need a day care for your dog while you work, look no further than the Sit Means Sit College Station Dog Boarding and Day Care. Your dog will have the time of their life staying in their own personal dog kennel at our fun and safe facility. With our new state of the art facility, you won’t have to worry about safety and can enjoy your vacation or focus on work. Your dog will never want to leave! We’re proud of the service we provide and we know you are too. 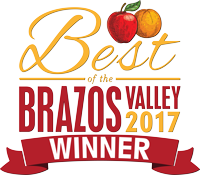 As a small business in College Station, referrals mean the world to us. As a way of saying thank you, we instituted what we think is the best referral program out there. When you refer 6 of your friends who successfully complete one of our training programs (equal or greater than your package) we’ll refund you the ENTIRE cost of your training. If you refer 12 of your friends, we’ll PAY YOU the amount you paid for training. It’s our little way of saying thank you for helping build our community of dog lovers! We service the following locations in the College Station area. Don&apos;t see your city&quest; Click here to find a Sit Means Sit Dog Trainer near you. 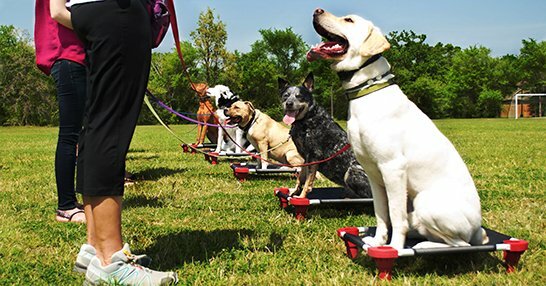 Click on one of our dog trainers below to learn a bit more about them. As a child my family would always get dogs straight from reputable breeders, and generally we were very lucky to get great dogs with great temperaments. But when I got into the workforce and wanted a dog of my own, having a puppy simply wasn’t an option – I just couldn’t devote the time and energy that a puppy needs to thrive. So I did what many well-intentioned people do, I went to pet adoption events and to the shelter and eventually rescued 2 dogs. Although they are great dogs and I loved them dearly, they came with their own baggage, emotional and behavioral problems that were beyond my ability to fix. Attempting to be a responsible dog owner I got on YouTube, read a few books, and set off to train my dogs. I worked with them for several weeks and thought I was making progress. I decided to test them and took them to the dog park to see how they did around distractions. 5 minutes into the visit my dogs became uncontrollable and I decided I was hopeless as a trainer. Like many of you I then turned to ‘professional’ help from one of the big box stores. After a few weeks (and a decent amount of money) I tried the dog park again. Same results, except this time I was older, poorer, and more perplexed than ever. I gave up and thought my dogs were hopeless. Then I met a Sit Means Sit Trainer randomly in one of those big box stores. They had complete control over their dog yet it was clearly very happy and very excited. I wanted that type of relationship with my dog. After speaking to my wife we decided to let Sit Means Sit train our dogs and opted for the 2 week immersion program. The results were phenomenal. I finally had dogs that would run and play but were also obedient, even around other dogs and heavy distractions. Right then and there I was a believer, but I also wanted something more. I wanted to help bring people the same feeling of accomplishment and pride that I got from my dogs. I wanted to help them have the relationships with their dogs that they so desperately wanted. So I decided to go all in and become a dog trainer. I have been training dogs for 6 years now and have experience with dogs of all sizes and temperaments. Ryan currently owns two amazing dogs, a pit bull/lab mix named Atlas as well as his demo dog/business partner, a cattle dog mix named Daisy. I have had dogs as family members since I was born, so I learned from an early age how dogs live, love and behave. That was the platform which launched my love for dogs and training. Having had the pleasure of living with everything from a Mastiff, to a Border Collie, to a Pit Bull Terrier, to a pure bred mutt, my love for dogs of all sizes and breeds goes far! When I was old enough, I started to volunteer at local shelters to help socialize and give attention to the dogs that wouldn’t have that otherwise in that environment. I saw the major disadvantage most of the shelter dogs had of never having any proper training, so they weren’t as ‘adoptable’ as a more calm and confident dog who had been thru some sort of obedience training. When I moved to North Texas to finish college, I volunteered at a large county shelter that was having a major problem getting the dogs adopted and was having to put a large amount to sleep. I started evaluating each dog to see what their personality was and to figure out what training they might need to help their chances of getting out. I helped rehabilitate many shy and nervous dogs, litters of puppies, and adults that had no exposure to humans and most would consider feral. I helped the more aggressive dogs get a second chance by training how to meet and greet other dogs. Finally, I was able to be part of a few rescues, forming my own and working with many others including Texas Husky Rescue. Thru that all, I saw how important the focus of the dog was, and how difficult it was to achieve with treats or just a leash. That experience was priceless, and after moving back to San Antonio I am continuing to help with rescues and the city shelter here in any way I can. The experience of learning that different training methods work with different dogs’ needs helped me look for a training program that helped grasp the attention of these dogs and also incorporate techniques that will teach them the right way to behave and live. Dogs that were literally stuck in a kennel for days on end until their stray hold was up and they could be considered for adoption were hyper and so happy to get out that they couldn’t focus on behaving and showing the wonderful side that I knew they were highly capable of showing. Finding Sit Means Sit methodology and techniques makes sense to me because if you don’t have the focus of the dog, you can’t move onto the next step of training! I loved what I learned with my own personal rescue Pitbull and couldn’t wait to start working for Sit Means Sit! Being able to get the full attention to teach a dog basic manners inside and outside the home is essential to a happy, confident and successful relationship with your dog. I want to help families and individuals have a wonderful relationship with their canine family members and help shelter and rescue dogs get the chance to live a happy long life they deserve! After graduating from Texas A&M with a B.S. in Wildlife and Fisheries Sciences in 2017, I joined the Sit Means Sit College Station team and haven’t looked back since! I had always loved dogs, and grew up around many different types of animals and have experience working with domestics like dogs, cats, and livestock to exotics such as reptiles, amphibians, and fishes! I also work part-time presenting wildlife education and outreach programs for the local museum. The most rewarding aspect of dog training is being able to bridge the gap between human and dog by not only training the dog, but teaching people how to build better relationships with their dogs, ultimately helping them live happier lives with their canine companions. Besides basic obedience, I also work with therapy and service dogs, and enjoy training my personal dogs in my free time for competition and sport. I currently have three dogs of my own–an Australian Shepherd, a Labrador/Rhodesian Mix, and a German Shorthaired Pointer, all with distinct personalities, which always makes training interesting! Through my time working with people and their dogs, I know that any dog can be trained, regardless of breed, size, or age, and I love being able to help our clients enjoy life more with their dogs. I can’t wait to work with you and see your pup accomplish their goals! My dog training career began in college, but my passion for animals has been with me forever. Our family always had a 1:1 ratio of pets to people, and there were 6 of us. I’m sure you can imagine the chaos, but I will only remember the love that each one had to offer. I couldn’t imagine life any differently. It was when I moved to college that I quickly realized how much that companionship meant me to. My dorm didn’t allow animals, but I was determined to get myself a furry friend. So, naturally, my first plan was to sneak in some guinea pigs. I got caught. Plan B came when I noticed the high volume of service dogs in training on campus. I have been a handler with Patriot Paws of Aggieland ever since. 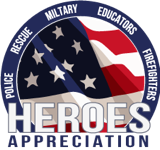 I have 2 years of experience as a volunteer training service dogs for veterans with disabilities through this amazing non-profit organization. I have raised and trained several dogs of various ages and breeds throughout my time with them. It gets tough having to give back a dog that I spend so much time bonding with, but I know I am only a stepping stone on their journey to a much more rewarding life. I began working at Sit Means Sit as a kennel technician during the spring of 2018. I have since become a Senior Trainer, and have enjoyed every minute of it. I love being able to teach people how to train their dogs. Training the dogs is the easy part, it’s training the owners that feels the most rewarding. I know I have done my job when I see a confident, happy person handling a confident, happy, obedient dog. We have so much to offer at Sit Means Sit, and I can’t wait to help you and your pup towards a happier life together! Hi, my name is Rachelle Garrity! I am part of the Fightin’ Texas Aggie class of 2019! A-Whoop! I am working on my Animal Science degree and hope to work with animals for the rest of my life. Growing up on a small farm, I learned to love all animals from a young age. I grew up with a variety of dogs from a small Jack Russell Terrier to two massive English Mastiffs, and some other incredibly great breeds and some awesome mutts. Once I was fully capable of taking care of a dog myself, I found my best friend, Piper. She is an incredibly smart German Shepherd/Rottweiler mix, that loves to learn new tricks and come to work to demo her amazing skills! Every dog holds a special place in my heart because they are creatures that love you more than they love themselves. Since I love every dog so much, this shows in my training. When training your beloved furry-friend, I take the time to get to know their great personalities and what works best for them in training. I hope to be able to bring out the best in your four-legged friend, and can’t wait to meet you both! My name is Taylor Minyard, and I’m currently a Junior at Texas A&M University majoring in Recreation, Parks, and Tourism. I plan on joining K-9 game warden unit after graduation. I currently have a two year old German Shepherd named Zala and a brand new Belgian Malinois named Zeke! While new to the Sit Means Sit family, I have a wide variety of dog training experience. 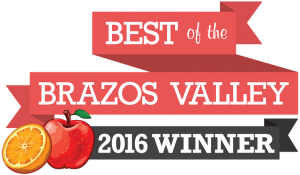 I’m from a small town – Itasca, Texas – where I lived on a farm filled with dogs, cattle, and even a wild hog! I’ve always been passionate about animals and I hope to continue that by getting a chance to train your special companion. Howdy! My name is Jessie, and I have never known a life without dogs. I grew up with family pets, and my parents thought having me volunteer at the local animal shelter would cure me of my puppy fever. Instead, we ended up with two more family members in the form of happy wagging tails for a total of four dogs! My own dog, a beautiful boxer mix named Eva, is one of those four rescues. I found Eva dejected, walking down the middle of a road near my home, spent three hours bathing and cleaning her matted hair and then worked with the shelter to adopt her when her initial owner was never found. Eva has been a happy member of our family for five years now, and she is my best training partner. 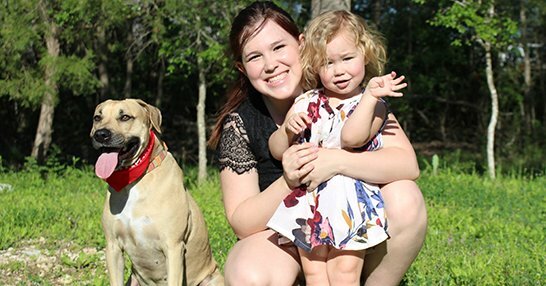 Beyond Eva, I was empowered while helping countless dogs at the shelter to find their “furever” homes and decided to pursue a career in Veterinary Medicine. I recently graduated from Texas A&M University with a BS in Biomedical Sciences and a Certificate in Public Health Entomology. During my time in college, it became evident that my passion for helping dogs had nothing to do with needles, stitches or scalpels. While I have the utmost respect for those who pursue a veterinary career, I have come to realize I desire the opportunity to build relationships with dogs that help them in their day to day lives. My dream career has evolved to include dog daycare, boarding, training, and a life of catering to the needs of precious puppies, of all ages. It is a joy for me to live my dream and care for and/or train your pups each and every day! Howdy, I’m Andrew! Ever since I could remember, I have always loved dogs. I grew up with dogs as a part of the family, and we were always lucky enough to have calm, well-behaved dogs. When I moved out, I eventually got not one, but two dogs of my own that needed a little more attention to training! It was chaos, but I eventually learned how to work with them and realized that the more manners my dogs learned, the more I got to do with them. I am currently a senior at Texas A&M University and work as a facility trainer and kennel technician at Sit Means Sit. Being an Eagle Scout, my hobbies include exploring the outdoors, and having my dogs trained has allowed for more freedom in adventuring and off-leash reliability, as I can trust them to recall back to me and listen at all times. Working with my own dogs has really shown me how rewarding training dogs can be. The benefits that training has brought to mine and my dogs’ lives have been countless, and I got into dog boarding and training with the intention of bringing people and their dogs closer together. I’m looking forward to meeting and caring for your dog, and helping you achieve your goals as a team! Howdy! I grew up in a small Hill Country town on a cattle ranch and my love for animals runs deep! Through my high school years, I was greatly involved in extracurricular activities like showing livestock, community involvement, and volunteering anywhere from veterinary clinics to children’s shelters. I always knew that working with animals was my passion and later realized helping people played into that dream. I decided to pursue an education as a veterinarian technician, and upon completing my education, I will further continue a degree in Agribusiness. I luckily came into the possession of a beautiful Red Heeler/ Black Lab mix as my first dog on my own. Not thinking, we ended up rescuing a second dog – a Blue Heeler/Australian Shepherd/ Catahoula mix that was on the euthanasia list. Both dogs are a blessing but had too much energy for us to handle! A few months later I applied for a job as a kennel technician here at Sit Means Sit. Through my position, I learned how to train my own dogs. I am now proud to be able to take my dogs out in public! The benefits and opportunities that training has brought to our little family have been countless. I love meeting new clients and can’t wait to help build a better relationship between you and your fur-ever friend! I joined SMS back in November, and waited a few months to review so that I could grow a full and honest opinion. This place is awesome, and I can give so many different reasons why. For starters, my dog was COMPLETELY out of control, to say the least. He is a lab-husky who I got at 7 months, and came with terrible habits from being raised in a poor environment. Trash digging, furniture chewing, carpet digging, running away, pooping in the house… the list goes on, and these are just some of the issues that came with him. He did his initial training back in November, and while he did not come back a changed dog, he came back with his terrible habits curbed, he gained the skill of being able to listen and learn to learn, and he continues to get better everyday that goes by. What you pay for is not simply just a two week training camp with an e-collar. You are paying for a lifetime membership with a community of dog-lovers that strive to help both you and your pet grow together in the best way possible. With the initial cost, unlimited group classes are included for life. This means at any of their locations, whether it be here in College Station, or if you move across states to a new area. You are a permanent member of this community and they have several group classes weekly to help keep your pets new-learned skills in line, as well as help you to continue to curb bad habits and learn new skills and tricks. Additionally with the cost comes 3 private lessons at whatever location you please, which is perfect for addressing specific issues, like issues with the dog and the cat, for example. Every dollar I have spent has already paid off, and it’s only been a few months. The staff here is amazing too. They are very polite, respond promptly to emails, and always work with your schedule to try and help with classes and last-minute boarding. They create a relationship with your pet as well, which is obvious when you attend class and see how your dog interacts with the trainers. To address the commenter who said the boarding was a rip off – You aren’t paying 15$ for play time because your dog is trapped in a kennel all day. They let the dogs out routinely, make sure they stretch their legs and get fresh food and water. The additional services they charge you for are optional “perks” if you want to treat your dog. They take very good care of the dogs here, and every time my dog Kirby comes home from a day or weekend boarding with them, even when I don’t pay for the extra-curricular stuff, he comes home exhausted and ready for a nap – something very unlike the husky in him. Training dogs is not an overnight miracle, or even fixed perfectly over the span of a couple weeks. It’s a process that continues and needs to be maintained, and Sit Means Sit helps you to understand that process and guide you along the way. They train your dogs in the training sessions, but they train you how to train your dog as well. I would recommend this place to anybody and everybody who feels their pet needs special attention, wants their dog to be extremely obedient, or who simply wants to invest in a life-long relationship that goes beyond just the initial training. I’m a full-time college student who works as well, and my dog was so out of control it would stress me out to the point I couldn’t go to class and had to quit my old job. Since then, I have been able to get my life back in routine along with adjusting Kirby to that routine as well. Before this training, he would be insane all the time, but he is laying down by me calmly as I write this since he has learned to adjust. As many of us college students struggle with money and time management, every cent I spent on this training was most definitely worth it. “Sit Means Sit’s training program has seriously been one of the best investments I have ever made. I picked my dog, Biggie, up last week and the changes in her behavior and previous aggression have been unbelievable! She’s a better listener, less territorial, and just an all around better behaved and happier dog! My dog has been able to get off of her very strong anti-anxiety medication and live a better life because of the trainers at Sit Means Sit. Her quality of life, as well as mine and that of my family’s is infinitely better and for that I will be forever grateful! “We took our two pitbulls to Sit Means Sit for training. Sit Means Sit did a wonderful job training our dogs. Kileaux was always easily distracted and Nikita was a rambunctious puppy. The staff was very knowledgeable and helpful in teaching us how to work with our dogs on continued training. Want to see more? 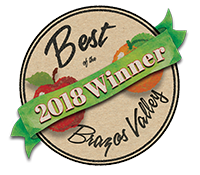 Click the button below to see our reviews compiled from third-party websites such as Google, Facebook, and Yelp.